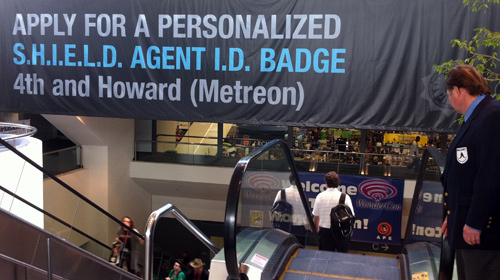 Custom SHIELD ID Badges Being Made at WonderCon + Sign Up! I am now a Level 1 S.H.I.E.L.D. Field Operative. I didn't expect to find any virals at WonderCon this year, the smaller San Francisco version of Comic-Con, but it looks like I was wrong! Those staying at the nearby Marriott hotel found a note in their rooms today indicating that there was a video on a channel to watch. Given I'm in another hotel I didn't see that, but I caught a giant banner inside the hall (see photo below) indicating that there was a tent nearby where I could get a custom-made S.H.I.E.L.D. ID badge (see photo above), so we stopped by and now I work for a government agency that doesn't exist (or maybe just Acura). It looks like Marvel is kicking off a big viral for their entire comic book universe that extends beyond just one movie, as we all know S.H.I.E.L.D. is the organization responsible for coordinating The Avengers and wrangling all the superheroes. There wasn't anything special going on at the ID tent besides the badge creation, but it's still pretty cool to get. There is also a new website launched at JoinSHIELD.com where you can sign-up for updates, but it says nothing will be on there until April 11th, so we've got a little while to wait. Either way, it looks like a big viral campaign for Marvel's movies is starting to heat up! Sign up online. S.H.I.E.L.D. stands for Strategic Homeland Intervention Enforcement Logistics Division and is the agency behind The Avengers. Marvel has Thor hitting on May 6th, then Captain America arriving on July 22nd. Are we going to be able to get one of these badges, like with the Encom badges for the TRON viral campaign? Not sure... If I were you, I'd sign up at JoinSHIELD.com just in case. I don't have the same connection with this viral as I did with Tron, so I can't confirm that or not... :/ But I would expect they'll send them from the website. I hope so, but I just signed up too! They just sent out an email today: Thank you for your interest in Strategic Homeland Intervention, Enforcement and Logistic Division (S.H.I.E.L.D.). Online entrance exams will begin at 0900 hours PDT on 11 April 2011. Report to joinSHIELD.com at that time for a complete debriefing.